What Really Causes Terrorism? It's Not Your Freedom. FACT 1: 95% of suicide terrorist attacks are targeted at occupying foreign militaries. FACT 2: 0% of suicide terrorist attacks have been directed at countries not militarily involved in geopolitical disputes. Robert Pape at the University of Chicago, with funding from the Department of Defense, has created the first comprehensive database of every suicide terrorist attack in the world from 1980 until today. The data reveal important truths that must be realized before there can be any hope of minimizing this threat. Every suicide terrorist campaign has had a clear goal that is secular and political: to compel a modern democracy to withdraw military forces from the territory that the terrorists view as their homeland. As Table 1 indicates, there have been 188 separate suicide terrorist attacks between 1980 and 2001. Of these, 179, or 95%, were parts of organized, coherent campaigns, while only nine were isolated or random events. Seven separate disputes have led to suicide terrorist campaigns: the presence of American and French forces in Lebanon, Israeli occupation of West Bank and Gaza, the independence of the Tamil regions of Sri Lanka, the independence of the Kurdish region of Turkey, Russian occupation of Chechnya, Indian occupation of Kashmir, and the presence of American forces on the Saudi Arabian Peninsula. Overall, however, there have been 16 distinct campaigns, because in certain disputes the terrorists elected to suspend operations one or more times either in response to concessions or for other reasons. Every suicide campaign from 1980 to 2001 has had as a major objective—or as its central objective—coercing a foreign government that has military forces in what they see as their homeland to take those forces out. 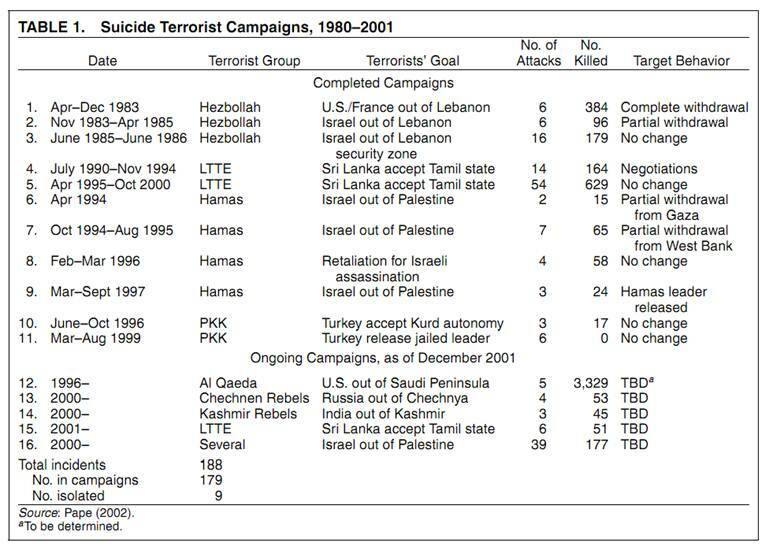 Table 2 summarizes the disputes that have engendered suicide terrorist campaigns. Since 1980, there has not been a suicide terrorist campaign directed mainly against domestic opponents or against foreign opponents who did not have military forces in the terrorists homeland. Although attacks against civilians are often the most salient to Western observers, actually every suicide terrorist campaign in the past two decades has included attacks directly against the foreign military forces in the country, and most have been waged by guerrilla organizations that also use more conventional methods of attack against those forces. political objectives against the Saudi regime and others, one major objective of Al Qaeda is the expulsion of U.S. troops from the Saudi Peninsula and there have been a tacks by terrorists loyal to Osama Bin Laden against American troops in Saudi Arabia. To be sure, there is a major debate among Islamists over the morality of suicide attacks, but within Saudi Arabia there is little debate over Al Qaeda’s objection to American forces in the region and over 95% of Saudi society reportedly agrees with Bin Laden on this matter (Sciolino 2002). The popularity of suicide terrorism is growing as a result of ground operations in Iraq and Afghanistan. 89 percent of all suicide terrorism around the world since the Iraq war is the direct result of troops on the ground. Time precedence: For 1 to cause 2, 1 must precede 2. The cause must precede the effect. The time precedence condition is satisfied since the troop increase occurs prior to the increase in attacks. Relationship: The variables must correlate. To determine the relationship of two variables, it must be determined if the relationship could occur due to chance. Lay observers are often not good judges of the presence of relationships, thus, statistical methods are used to measure and test the existence and strength of relationships. The relationship condition is obviously satisfied because the magnitude of the upward trend completely dwarfs any random variation exhibited prior to the US invasion. Nonspuriousness (spuriousness- not genuine): “The third and final condition for a causal relationship is nonspuriousness (Suppes, 1970). For a relationship between X and Y to be nonspurious, there must not be a Z that causes both X and Y such that the relationship between X and Y vanishes once Z is controlled” (Kenny, 1979. pp. 4-5). that violently invading and occupying a country will increase animosity among the population that is being invaded. This animosity tends to manifest itself in the form of terrorist attacks perpetrated against the violent invader. The nonspuriousness condition can be assumed to be satisfied unless some other causal factor that better fulfills the relationship and time precedence conditions is identified.] that violently invading and occupying a country will increase animosity among the population that is being invaded. This animosity tends to manifest itself in the form of terrorist attacks perpetrated against the violent invader. The desired end as defined by the Bush administration would be the elimination of terrorism. They attempted to achieve this using the means of military invasion and occupation. The above graph suggests that the means used did not achieve the desired end. In fact, the means produce the opposite of the desired ends. According to Pew polling, a majority of the public (61%) believes that the ability of terrorists to launch a major attack is about the same (44%) or greater than (17%) it was at the time of the 9/11 attacks. So the public doesn’t think the hundreds of billions spent on the War on Terror are producing any reduction in capabilities. Yet, somehow the the majority of the public (71%) continues to say the government has done very (22%) or fairly well (49%) in reducing the threat of terrorism. It’s hard to understand how one can think the government is doing a good job at reducing the threat of terrorism when one believes that it hasn’t been reduced. 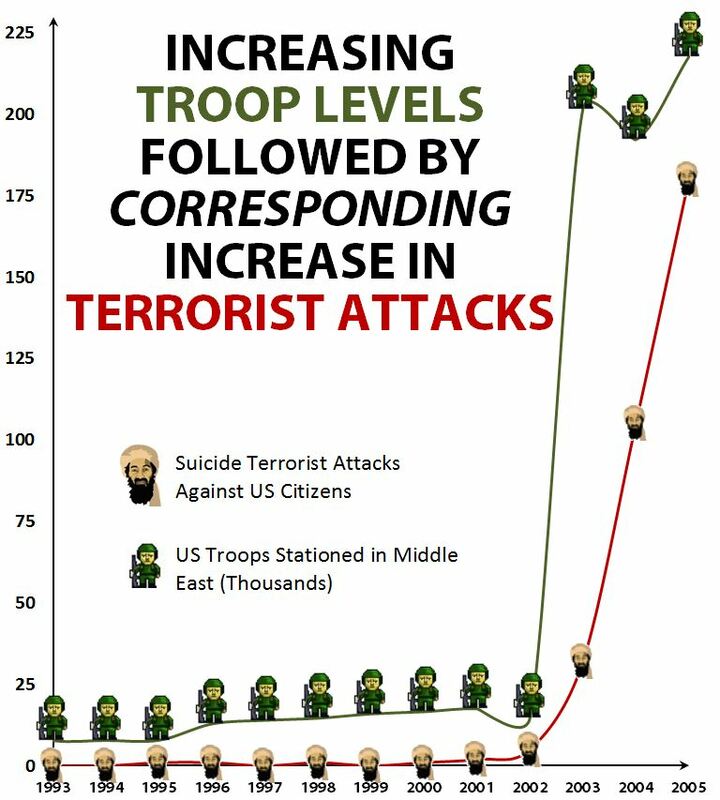 The data clearly indicate that increasing the degree of US military occupation in majority-Islamic countries, will only serve to increase the threat of terrorism. I’d never accuse the American public of being quick, but they do seem to learn over time. Half of Americans (50%) now believe that decreasing the U.S. military presence overseas would be the more effective policy, while just 31% say an increased presence would be more effective.